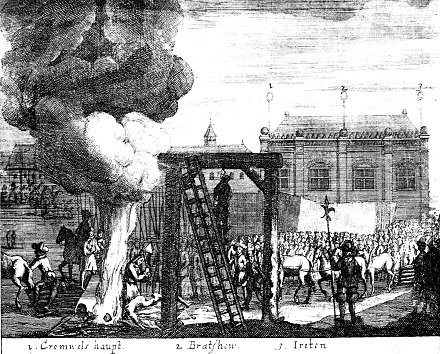 On this anniversary date of King Charles I’s beheading, the two-years-dead corpse of the late Lord Protector Oliver Cromwell was hung in chains at Tyburn and then beheaded, along with the bodies of John Bradshaw and Henry Ireton. The great-great-grandnephew of ruthless Tudor pol Thomas Cromwell rose higher than any English commoner, high enough to be offered the very crown he had struck off at Whitehall. Oliver Cromwell declined it in sweeping Puritan rhetoric just as if he hadn’t spent weeks agonizing over whether to take it. “Cromwell lifting the Coffin-lid and looking at the body of Charles I”, by Hippolyte (Paul) Delaroche — a French painter with an affinity for English execution scenes. The painting is based on an apocryphal but irresistible legend, also used by Nathaniel Hawthorne in a tedious short story. And not only England. 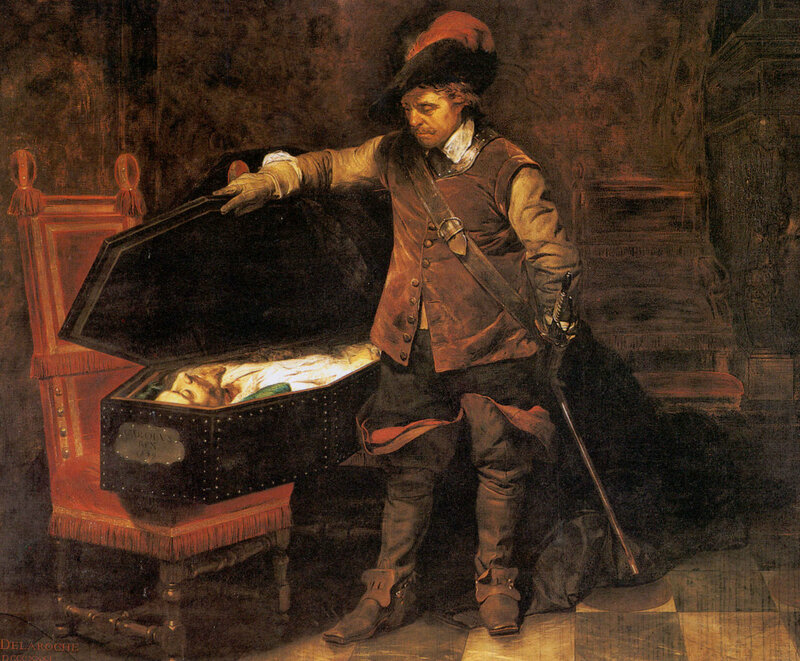 Cromwell’s prodigious depredations in Ireland — justifiably or not — remain a source of bad blood. The English Commonwealth foundered after Cromwell’s death, however, and restoration of the monarchy — a rock, as it turned out, on which the Puritans’ bourgeois revolution could erect its colossus — came with the price of a few examples being made. Of course, “executing” dead guys displays about as much strength as it does sanitation, and for all Charles II‘s demonstrative vengeance, the politically circumscribed throne he resumed was very far from his father’s dream of absolutism. Between the late dictator and the new king, the future belonged to the corpse clanking around on the gibbet. In the emerging England of the century to come, the divine right would depart the Stuarts for another dynasty more amenable to the rising authority of the parliament whose sword Oliver Cromwell once wielded. 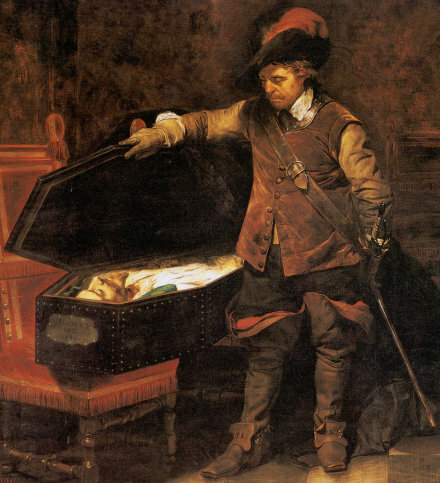 * Resources on the particulars of Cromwell’s career, the English Civil War, et al, are in plentiful supply online. This BBC documentary is a very watchable overview: part I; part II; part III; part IV. ** James II remains England’s last Catholic monarch. Right. So I was all prepared to defend Hawthorne until I clicked on the link and read the short story. Correction: skimmed it until I couldn’t take it anymore. Seriously, “tedious” is being gracious. More like, wretched and amateurish.